Ideal for running bottles or containers that tend to “tip” or are “top heavy”. Typical filling ranges are from 1 gram to 5 LBS. 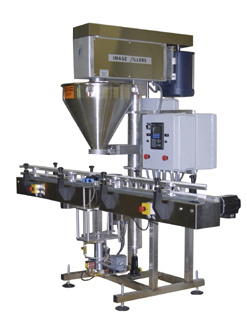 This is an Image 3000 with a conveyor that stops and starts at each fill cycle. Some containers have small openings or want to tip when you move them. We typically keep the chain running the entire time and its slips under the container. This machine will stop the chain at each fill. Multiple augers may be needed to run different fill weights. 36”, 48”, and 60” diameter unscrambling.